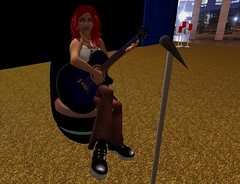 I found myself at a loose end the past couple of evenings so I decided to check out the live music scene in Second Life. Yesterday I attended a gig by Uncle Funky Shoes (Ufs Hyde in Second Life). Unfortunately the sim was extremely busy and didn’t rez well, so I didn’t take any snapshots. However, the music was great – bluesy guitar stuff, an engaging performer, and a good time. I couldn’t find anything about him on the Internet. This afternoon I managed to get in touch with Lady Serra, who setup the UncleFunkyShoes Fans group in SL, and found out that although there are a couple of MP3s available, they don’t currently have a website. I offered to help out and pointed her at wordpress.com for a blog… need to find somewhere to host a few music files, and they should be all set. I hope I can help them here, as it seems crazy that he is not online yet. 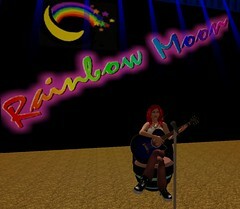 Tonight I came across a lady called Mel Cheeky, gigging at the Rainbow Moon Club (slurl: Helvellyn 78,204,502). Mel is the SL incarnation of Melanie Fudge, based in Wales in the UK. She has a great voice, although apparently she’s getting over a flu bug and was getting a bit croaky so had to cut the set short… and I arrived late… so it was all a bit short but I hope she recovers soon. All I can say is wonderful voice (even when she’s ill! ), with very laid back folksy guitar – just my kind of thing. Realistically I’m not likely to get to gigs by these people in real life, so this is a great way to consume the music. You can even interact with the performers via on-screen chat, and generally the events are fairly small and intimate so it is different to some real life gigs. Worth a try. I’m also very excited that Ben Folds is going to be performing in Second Life next week. I’ve registered for the event, but it is going to be at a fairly unreasonable hour in the UK so I may miss it. This entry was posted in Uncategorized and tagged Music, Secondlife. Bookmark the permalink.